This week a telenovela came to our house. On Thursday, when my six year old son and I were returning home, as soon as we entered the front door a bright light somewhere on the upper floors and a man’s bawl immediately attracted our attention. "Fire!" joyfully said my son. As we walked up the stairs, the light became brighter, clamours louder. No fire, no smoke. Instead on the 4th floor we were met by about 10 people, cameras, and floodlights. “Looks like a spaceship!” happily concluded my son. "Lights, camera, action!" commanded a man. Landings in our building are pretty narrow. Because of so many people their spotlights and cameras, it was difficult to pass. I said hello. A few people muttered something in response. “What are you shooting?” I asked. "In the city," they told me reluctantly. "What in the city?” I asked again. A day before, I attended a press conference convened by the few Armenian artists and directors, at first to celebrate their professional holiday (November 21 is World Television Day ) and secondly, once again complain about the quality of the TV programs produced by local channels, the abundance of low-grade, non professional and frankly, stupid shows. So, Karen Kocharyan, a veteran showman remembered with nostalgia the Soviet times, when for a minute delay for the work there was an imposed fine, for an on air, there was again imposed a fine, and when the quality of programs were controlled by several bodies (he meant not censorship, but control over the pureness of the language, well done scripts, etc.) and television had an educational mission. Of course, they touched upon the issue of soap operas. And of course they criticized them. And even admitted they did not know how to deal with them. Frankly, the talk and criticism of serials in Armenia has, itself, become a show. Soap operas divides Yerevan citizens into 2 groups. Those who watch, and those who criticize. Those who do not watch soap operas, criticize those who watch them. 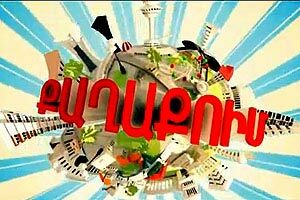 Those who watch belong to sub-groups: those who watch H1, or Armenia TV, or Shant TV or some other channel. There are about 15 channels in Armenia and most of them produce soap operas. During the last couple of years, the Armenian soap operas are subject to severe criticism. Intellectuals, lawmakers, psychologists, ethnographers have touched upon the content of soap operas. Critics say soap operas, advocating aggression, domestic violence, misfortunes and hard living have a dysfunctional influence on audiences, which makes half of Armenia’s population. The critics say the soap operas harm first of all young people’s psychology. Still, there are no changes. Only more soap operas. Producers say they’re simply giving people what the people want. For example, “Djvar aprust” ( Hard life) is among the top criticized programs. Most of its content is men’s mockery of women. But its director Diana Grigoryan believes her show reflects real life. She also believes that those who criticize her show are in fact its secret fans. There is one question Grigoryan never can answer: What’s the idea of her scenario? What’s the final goal of showing cruelty? I used to be a fan of soap operas. After the fall of the iron curtain, hundreds of foreign soap operas, mostly Brazilian, flooded the Russian TV channels and I watched a lot of them. But I never could watch any Armenian soap operas. They’re no good. Maybe because none of the Armenian channels has even a tiny percentage of the capacity and financial means that the Brasilian Globo has, the world’s largest producer of telenovelas, which allows them to build pavilions as big as any real one in Yerevan. But on Thursday, when I found an “In the city” crew in my building I decided to get an idea what this one is about. I found a few episodes in the internet and what I watched was even worse than my worst expectation- the soup operas. What claimed to be a comedy was flat and the “acting” should never make it to a grade-school stage, to say nothing of being on my television.. Finally I thought about my most important question: Why was the soap opera being shot in our building? I remembered that had not seen my Iranian neighbor for a long time. And the episode was shooting in his apartment. I walked through the door and watched the process. They were shooting an episode where the guy had to leave the apartment, saying “eh” and go down the stairs. After the tenth or so take the director was happy. “When will you finish? I asked. The director looked at me as if don’t understand how important his work is. "“Why exactly you are so interested? But the director has no time for me. He again said something and crew began to rearrange spotlight and cameras. "We are about to finish soon" said someone from the group, "and we rent an apartment here”. Last week the Youth Initiative "We will not keep silence" announced a winner of the ceremony “The Trash of the Air”. The winner became “The General's Daughter", a soap opera broadcast on Armenian Public Television. It “won” for promoting degradation of the Armenian people and mocking the Armenian army. The monitoring will last until December 15, when the winners will get via email a certificate of victory and 100 AMD (25 cent) - the amount for trash disposal. Meanwhile I will keep watching the shooting of my new neighbors, “In the City”. May be if I watch the process I will be not so irritated watching the results. Or not.